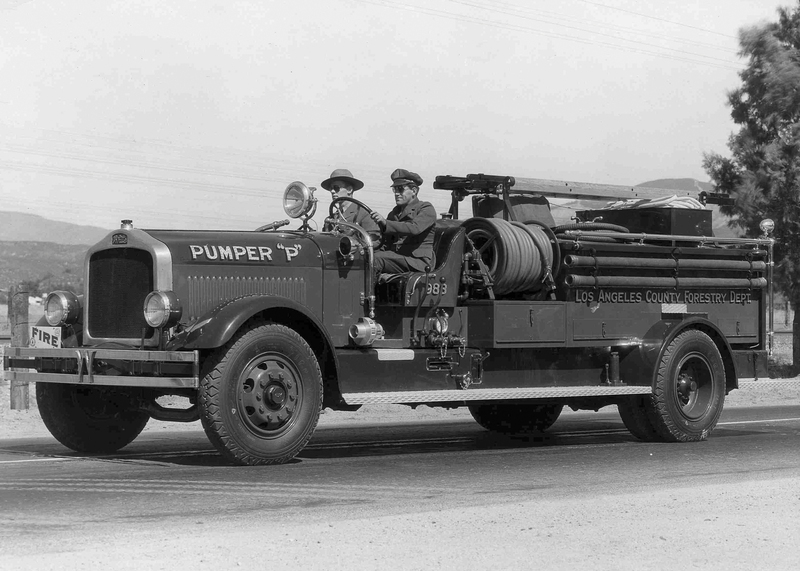 A 1933 White 600-gallon pumper (White Motor Corp. of Cleveland) heads northbound on San Fernando Road — later called Railroad Avenue — across the street from the L.A. County Fire Protection District's Soledad Division Headquarters (which later became Fire Station 73 at 24875 Railroad Ave.). The Los Angeles County Fire Department was born from the State's Forest Protection Act of 1905 out of a need to protect our watershed (read: drinking water). The County Board of Supervisors appointed the County Fish and Game Warden to the additional position of Fire Warden. This soon evolved into the Los Angeles County Department of Forester and Fire Warden, a title our fire chief still holds today. It wasn't until 1954 that the two "departments" merged and became the Los Angeles County Fire Department. The White Motor Corp. was created out of the White Sewing Machine Co., begun by Thomas H. White in 1876. His son, Rollin Henry White, invented the auto flash boiler in 1899, and with the aid of his two brothers, Windsor and Walter, diversified the sewing machine company's products by introducing trucks and the White Steamer automobile in 1900. Although White outsold its nearest auto competitor 2 to 1, Thomas White dismissed the importance of the car, which led his sons to organize the White Motor Car Co. in 1906 on Canal St. in the Flats (the floodplain of the Cuyahoga River in Cleveland). In 1909 the company made its first vehicle under its own name. During World War I, the company shifted to trucks and stayed with the product after the war, becoming the No. 1 maker of trucks and custom vehicles. When sales plummeted during the Depression, White temporarily merged with Studebaker in 1932, but two years later it independently reorganized as the White Motor Corp. Under Robert Black, the firm became a major producer of heavy-duty trucks and buses. During World War II, the White plant at 842 E. 79th Street was converted to the manufacture of military vehicles. During the postwar period, White Motor acquired leadership in the heavy-truck and the farm-equipment fields by purchasing small truck makers and small farm-machinery companies such as the Oliver Corp. The company increased sales from $130 million in 1950 to $770 million in 1967 and bought Euclid Inc. in 1968, hoping to increase its market share in the off-road truck field. White Motor went heavily into debt as a result of these transactions. After a merger with White Consolidated Industries failed in 1970, White Motor hired Semon "Bunkie" Knudsen to reorganize the company. Though White Motor showed a $20 million profit in 1973, Knudsen's leadership could not counteract years of mismanagement, coupled with changes in the industry, inflation, and recession. He sold off one-third of its assets, including the profitable Euclid, Inc. hauler operation, moved headquarters from Erieview to Eastlake, and cut employment. White moved truck production from the E. 79th Street plant to Virginia and converted it to parts fabrication in the late 1970s. In September 1980, White Motor filed for bankruptcy, and between then and December 1981 lost $311 million. In August 1981, Sweden's AB Volvo bought all of White's truck-producing plants except the Cleveland plant at E. 79th Street, because of its age and large pension fund liability. White sold the plant in 1983 and made a pension and benefit settlement with the workers. After a prolonged bankruptcy proceeding, the White Motor Corp. ceased to exist in 1985. Volvo kept the White name for a number of years before finally retiring it in the late 1990s. FD3301: 19200 dpi jpeg from jpeg courtesy of Fire Capt. Paul Peppard, Station 73, Los Angeles County Fire Department, 2014.